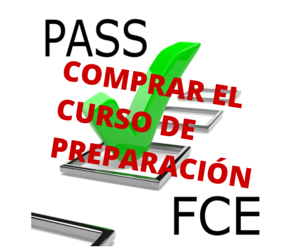 In this episode of PASS FCE I’d like you to meet two FCE students who are studying with me at the moment, Miguel and Pau. This isn’t a full FCE Speaking test, but I do ask some questions that are similar to those you may hear in Part 1 of the test. So let’s start straight away. Let me introduce you to Miguel. Miguel spoke very well, he didn’t seem to be nervous and he was very clear and easy to understand. I liked his first answer when he used the present perfect continuous very well, he said “I’ve been studying English for 10 years, more or less”. He also used the present continuous correctly when he spoke about a future plan. He said, “I’m taking the exam in June.” – wonderful! Miguel remembered that after some adjectives like ‘easy’ ‘difficult’ etc you need a pronoun and then the infinitive with ‘to’. He said, It’s easy FOR ME TO PASS this part of the exam. Very good! It wasn’t clear to me exactly what Miguel’s job title is. I understood manager, but the first word wasn’t clear. However, I did understand that he works for a cosmetics company. It’s very important to know how to talk about your job, studies in English, so check the translation in English and learn some key words so that you can talk about it easily and clearly. Miguel loves horses, but he said “I like to riding horses”. After verbs ‘like’, ‘love’, ‘hate’ etc we can use a gerund or an infinitive, but not both. The easiest is to use the gerund. I like riding horses, I love going skiing, I hate doing exercise, etc. Miguel made a small mistake with a tense when he said “I went to my…village..”, but he quickly corrected himself and said “I normally GO to my village every weekend” This is exactly what you should do in the exam. Correct yourself immediately if you make a mistake so that the examiners see that you know the correct grammar or expression. Now let me introduce you to Pau. If you listen to our other podcast for Spanish speakers Aprender Ingles con Reza y Craig at inglespodcast.con, you may have heard me speak about Pau and answer some of his questions on the podcast. Pau is the question king, and I love getting Pau’s questions and answering them with Reza on the podcast. Teachers love getting questions from students who are thinking about the language, so if you are studying with a teacher at the moment, ask a lot of questions. Anyway, let me introduce you now to Pau. I think you can hear that Pau is really working hard on improving his pronunciation, and it’s working! He sounds clear and he’s concentrating on his vowel sounds and he’s trying to speak English with correct and accurate pronunciation. He speaks quite fluently and with confidence. He’s working FOR a company. I work FOR the British Council. Maybe you work FOR yourself, which means you are self employed, but the correct preposition is FOR. Both mean to be similar to. To look like” is appearance and physical features. To be like (I’m like my sister, for example) can be personality or physical appearance. Reza and I speak more about these expressions on Aprender Ingles con Reza y Craig episode 44. I’ll put a link to that episode in the show notes and transcription at inglespodcast.com. Pau said that he “used to make sports”. He uses ‘used to’ correctly here because he’s speaking about the past, but the collocation with sports is DO, not make. So, “I used to do sports” is correct. I was pleased to hear Pau say I’ve got a long weekend to enjoy MYSELF. It’s a common mistake to forget that enjoy needs an object, enjoy the party, enjoy the film, enjoy life, enjoy it or, in this case, a reflexive pronoun enjoy myself. Pau tries to use the second conditional, which we haven’t practiced in class yet, so I thought that was very adventurous. 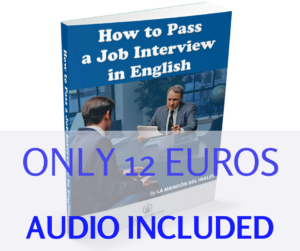 He says “If I have more time, I’ll like to learn French” Because it’s a hypothetical situation (Pau DOESN’T have time), he should have used the past simple – “If I had more time” and the conditional ‘would’ “I would like to learn French. So, “If I had more time, I would (or I’d) like to learn French. Don’t worry Pau. we’re going to study conditional ‘if’ sentences before the exam. Pau speaks about visiting the USA quite well, He’s attracted to the way of life and New York is the biggest, most important city he could visit. He says it’s a ‘mix of cultures’. With these questions, you are expected to give reasons and justify what you say. Explain your choice and speak about how you feel. Our CD New MansionFirst is full of practice material, useful advice and realistic exam practice tests that will prepare you for taking the Cambidge FCE exam. 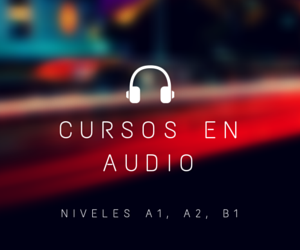 This course is now also available as a digital download direct to your PC. I have the app for smartphones Inglespodcast and I use it in every trip but, I want to listen to the FCE pass podcasts in my mobile. Is it possible? Thank you. Yes, just go to the webpage and listen directly from there. You can find the PassFCE podcasts in the ‘podcasts’ menu. They are also in the podcast app, but you have to look back a year or so. I need to make more of those!